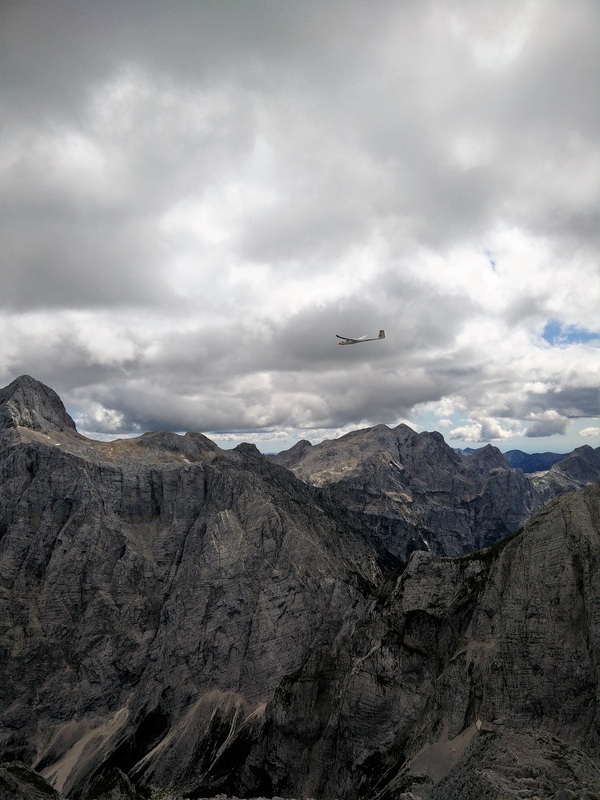 Stenar is a 2501 meters high mountain in the heart of the Julian Alps in Slovenia. 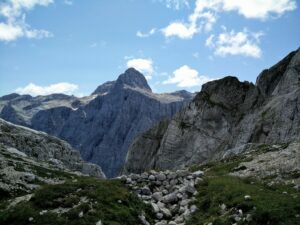 Unlike many other mountains in this area, Stenar is not well-known among hikers and mountaineers and therefore the trail is typically not very busy. This is indeed an advantage as it allows you to set your own tempo without the need to slow down or scramble your way past other hikers; keep in mind that trails in the Alps are usually very narrow and exposed. 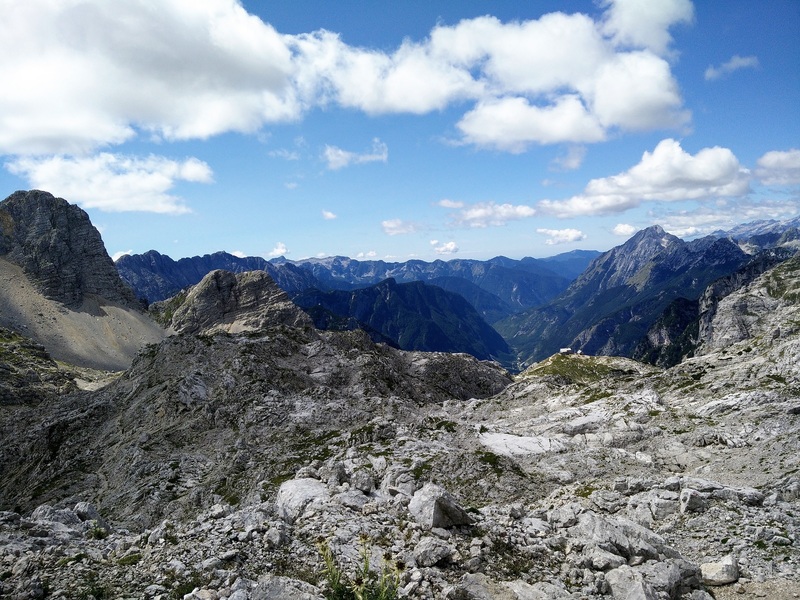 The smaller number of hikers also significantly increases the chance of seeing the fascinating alpine wildlife – surefooted animals such as alpine ibex or chamois are very common in this area. 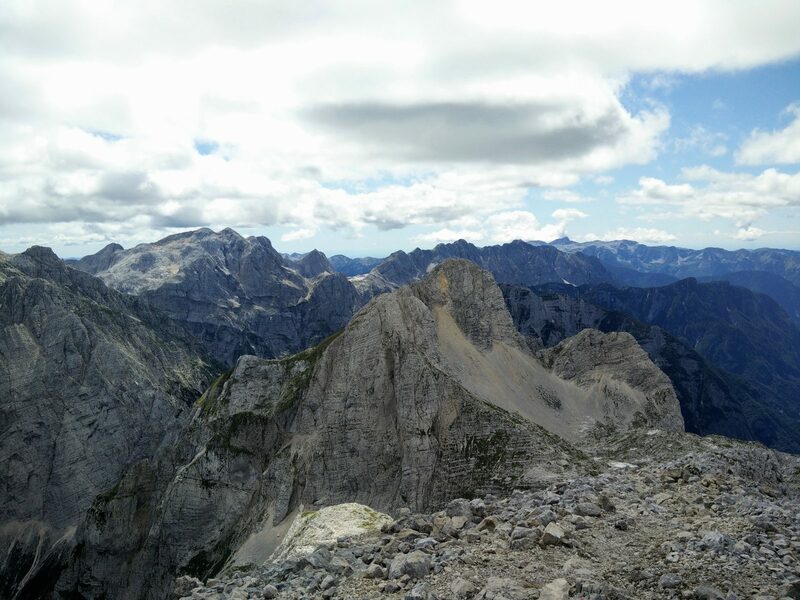 Even though the peak is not as popular as many other peaks in the Julian Alps, it offers a great view on the surrounding peaks (Triglav, Skrlatica etc.) as well as on the Trenta valley beneath. This made Stenar the perfect choice for avoiding the crowds in the Julian Alps in the peak of climbing season (August). The Stenar trail is technically and physically challenging and thus it requires good physical preparedness and some mountaineering skills. 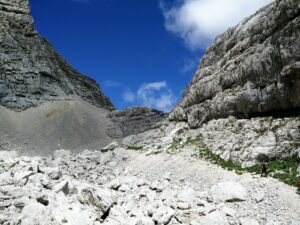 Over the distance of 9.5 kilometers it ascends for 1500 meters and crosses several exposed spots. Nevertheless, I think that the trail is suitable for everybody who is fit and not afraid of heights. 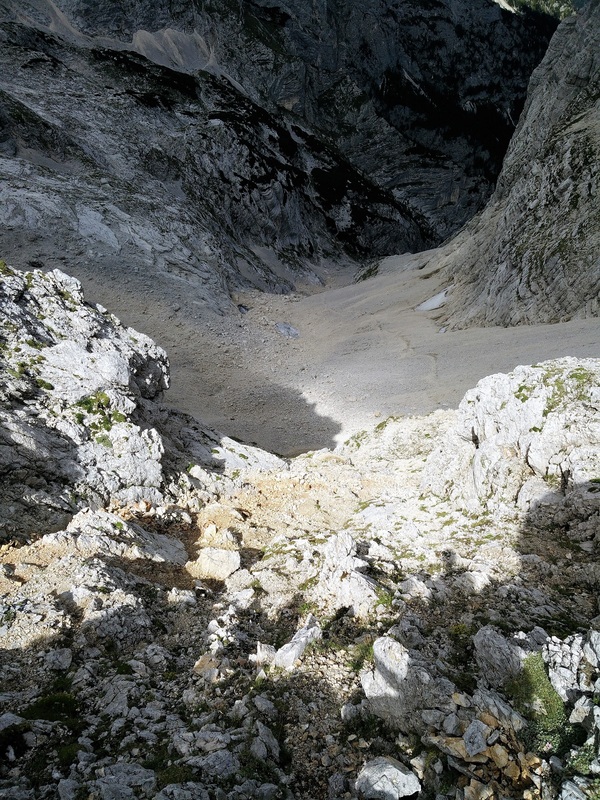 If the trail is covered with snow (usually in winter, early spring and late fall) the ascend is much more difficult and requires equipment such as crampons, ice axes and gaiters. The trail starts at mountain hut Aljazev Dom near the towns of Mojstrana and Jesenice. To reach Aljazev Dom mountain hut you should drive along the Slovenian E61 highway towards Jesenice until you reach the Jesenice-Zahod exit. Take the Jesenice-Zahod exit and continue driving on the road 201 towards west (direction of Kranjska Gora). After driving for approximately 7 kilometers you will come to a crossroad. Here you should go left towards Mojstrana and Vrata (there is a direction sign at the crossroad). Then drive through the village of Mojstrana towards south-west. The asphalt road will soon turn into a gravel road and start ascending rapidly. Drive on this road until it ends – there is a big parking lot at the end of the road. The parking fee is relatively inexpensive – it will cost you 3.5 € ($ 4.1) for parking a whole day. I do recommend that you come early in the morning (8 a.m. at latest) as this parking lot is starting point for many hiking trips in the area (not just to Stenar) and thus gets full very fast. The gravel road is in good condition and doesn’t require a 4×4 vehicle. Unfortunately, the Aljazev dom mountain hut is due to its remoteness not accessible by public transport. The Stenar trail is well-marked with painted red and white circles on trees, rocks etc. There are also numerous direction signs along the trail. Therefore, navigating the trail shouldn’t be a problem. From the parking lot, start hiking on a wide dirt track towards south-west and after hiking for 300 meters or so you will reach the Aljazev dom mountain hut. 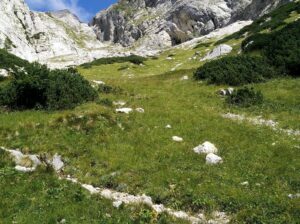 Continue past the mountain hut and the wide dirt track will soon turn into a narrow path. After hiking on relatively flat terrain for 1.5 kilometers (from the starting point), the path will change its directions towards north-west and start ascending rapidly. Stay on the path and after ascending for 3 kilometers (elevation gain of 1000 meters) you will reach the top of the ridge. Now you should clearly see the Stenar peak on your right (direction of north-east). I was so lucky to see no less than three chamois on the top of the ridge – relatively close to the path. From here on you should continue on a narrow path towards north and soon you will arrive to a crossroad. Here you should go right (east) towards Stenar. Please note that this stretch is missing on the GPS track above as I accidentally pressed pause button on the top of the ridge and didn’t notice until I reached the peak. From here on the trail becomes technically challenging and crosses several exposed spots. However, there is only 400 meters of hiking left to the top (with an elevation gain of approximately 200 meters). 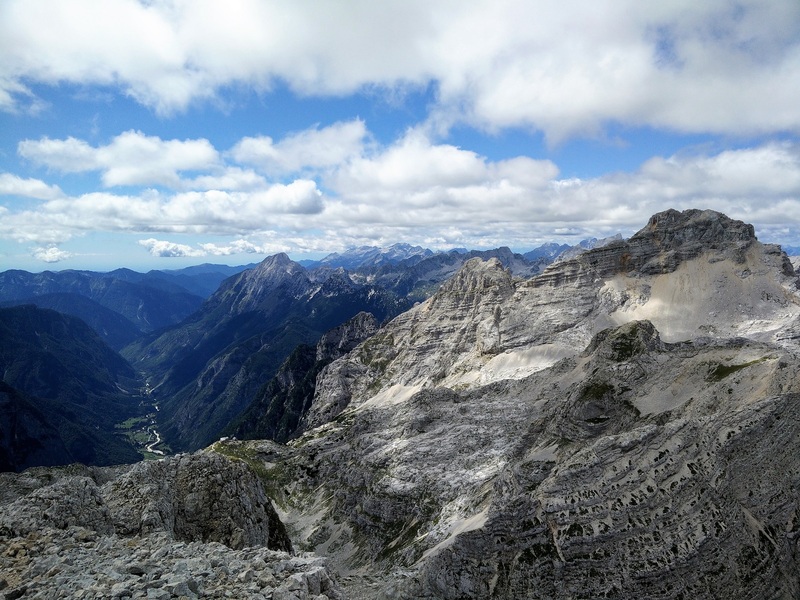 On the top, you will be rewarded with a great view on numerous peaks in the Julian Alps. You will see Triglav and its impressive northern wall (south of Stenar) as well as the 2740 meters high Skrlatica mountain (north of Stenar). As the weather was good I decided to take another path for the way down. From the peak, I descended to the ridge and then continued on a narrow path towards north-east for a couple hundred meters. Then I descended from the ridge over the scree and soon I reached the trail Aljazev dom – Skrlatica. I then used this trail to come back to the parking lot. I do recommend descending the mountain this way as it’s much faster – especially the first part where you can slide down the scree very fast. 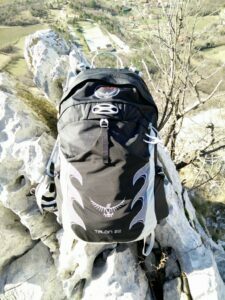 As the weather was good and the temperatures were relatively high I packed my daypack super light. During the hike, I was wearing the Icebreaker Merino T-shirt, Montane Terra Pack pants, Salewa Mountain Trainer Mid hiking boots, Woolx Merino Boxers, baseball cap and socks made of Coolmax fibers. In my Osprey Talon 22 daypack I was carrying the Mountain Hardwear Monkey Man fleece jacket and Montane Minimus rain jacket in case of bad weather as well as food, 3 liters of water and some accessories. On the top it was quite cold and thus I had to put my fleece jacket on. 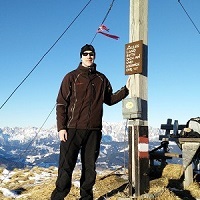 As there was no wind, my Montane Minimus jacket stayed in the backpack throughout the hike. 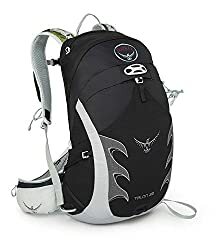 The Osprey Talon 22 has become my backpack of choice for day hikes. It is super light (it weighs merely 750 grams) and has many well-placed pockets and attachment points. I’m especially satisfied with the Stow-On-The-Go trekking pole attachment system which is very useful for technically challenging hikes as it allows you to conveniently store trekking poles so that they don’t get in the way while you are climbing. 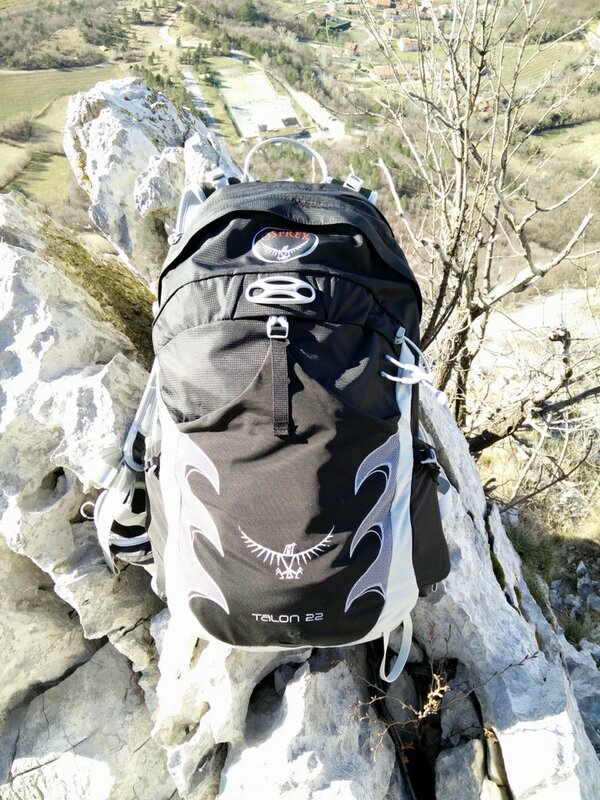 Check out the full review of Osprey Talon 22 daypack here. 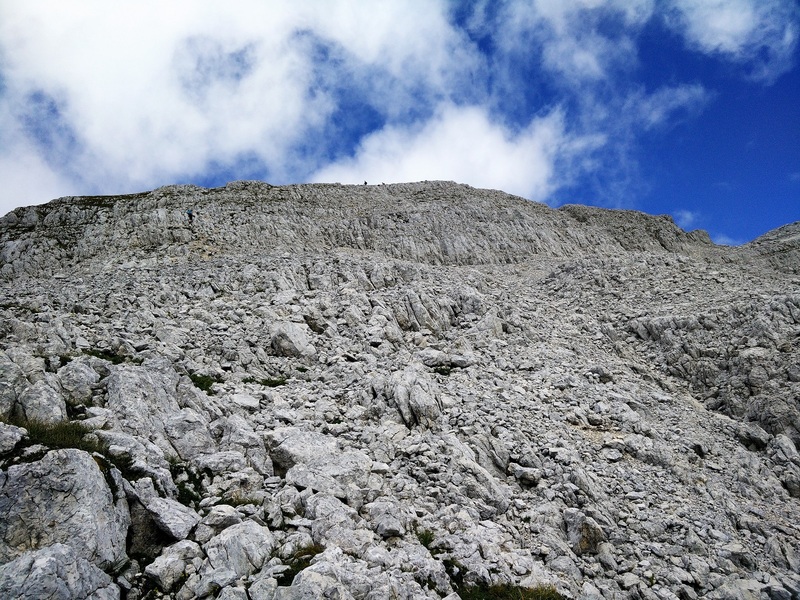 The Stenar trail is suitable for everybody who is fit and not afraid of heights. Don’t forget to bring enough water with you (+ 3 liters) in summer and some warm clothing regardless of season as it can get quite cold on the top. I also recommend bringing a sun cream and headwear for protection against the damaging UV rays. In any other season, check out the conditions on the trail before going. If the trail is covered with snow you will need crampons, ice axes as well as some knowledge of winter hiking. As thunderstorms are quite frequent (and dangerous) in the Alps, also check the weather forecast before going. In case of bad weather, I recommend you postponing the hike.